There are, it turns out, several artists with either the first or last name of Lewis. 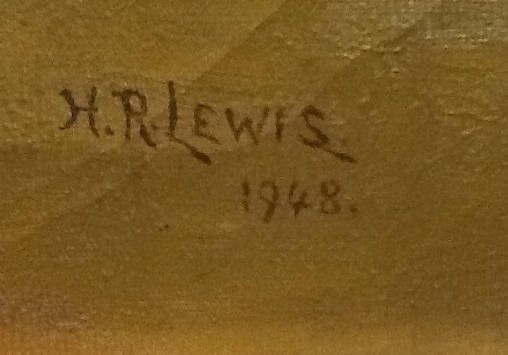 Unfortunately, since Hubert Lewis signed his art either H. Lewis or H. R. Lewis, it has led to much confusion among those trying to sell his works. I have found pieces that looked like works I had seen personally, and the signature was like those above, either H. R. Lewis or just H. Lewis, but they were listed as Henry Lewis, or Lewis Harris, and his prints have been called R. Atkinson Fox work’s using the pseudonym H. Lewis. I am sure there are probably others artists hen has been confused with, but these are the ones I have proof of, and have been able to find. Other clues for me to understand these were indeed from my great grandfather, besides the signature, were descriptions of who had the art before it was to sell at the auction house and where it came from. If it was from Pennsylvania, or New Jersey, New York, or Ohio, and had the same signature, then it gives just that much more credence that it is Hubert’s art. I have corrected a few ebay listings, as has another Hubert Lewis art collector, when we see what is probably an H. Lewis piece. First, I ask to see a signature, if it isn’t shown well on photos of the listing. Everyone who I have asked to do this complies. Then if it is a Hubert Lewis signature, I explain to the seller that the listing is either incorrect if they have listed another artist instead, or I give them information about Hubert Lewis so they can share it on the listing if they want. One auction site had a photo of a landscape, with the description “Lewis Harris-Dutch Landscape After Gorter, Pastel signed lower Right H. Lewis and inscribed After Gorter.” Unfortunately, I cannot see the signature to determine if it is indeed a Hubert Lewis pastel, but I am not sure why an artist named Lewis Harris would use H. Lewis rather than L. Harris as his signature. And it does look a great deal like Hubert’s work. However, I cannot verify this. Up for auction is a gorgeous ORIGINAL pastel painting, signed H. Lewis in a home made frame. We went out and researched H. Lewis pastels and found this, that certainly matched this pieces description of material. From a forum on H. Lewis. I have an H. Lewis painting of flowers in a vase framed by a hand made frame similar to the one displayed here. I was given this painting by a woman whose house I had purchased in 1993 in Nutley, NJ. She had about 150 painting all by H. Lewis. It turns out that H. Lewis was her grandfather. H. Lewis was from from Europe (a Dutch painter). He and his brother (whose 1st name escapes me) also was a painter but was not as good or popular as H. Lewis (I don’t remember what H stood for — but it was not Hugo). Miss Lewis (the grand daughter) was in her 80’s when I bought the house from her and was never married. She inherited all of his art which will go to her nephew when she dies (she already may have passed away). One of H. Lewis’s paintings of a flower garden that has steps leading to a pond is quite famous and was highly reproduced in the 20′ and 30’s. H. Lewis made his own frames and often were quite ornate. H. Lewis also worked with pastels — I saw many of his unfinished works, mostley done on thick paper resembling cardboard. This painting depicts a fall landscape with bright colors accented by his bright red frame. It measures approx. 24 3/4″ x 16 3/4″ framed. WONDERFUL!! If anyone can add any additional information on H. Lewis would greatly appreciate it. And I too saw that information on the forum, and when I read it, I realized the poster was describing my mother’s cousin Virginia, aka Ginnie, as the aunt who had many of H. Lewis paintings. The signature on the piece is certainly Hubert Lewis’s. So this is another way that misinformation is spread; someone is trying to research the piece they have and they happen on a forum where others are trying to figure out who the artist of their piece is as well. Unfortunately, on that particular forum there is a lot of misinformation about the pieces signed H. Lewis, because he most certainly was not Dutch, but there are also facts within all the posts, as well. Which is another reason I started this blog and am writing these articles, to help clear up confusion and misinformation. Because I also do not want to spread misinformation about Henry Lewis, Lewis Harris, Hugo Lewis, or R. Atkinson Fox, or any other artist for that matter, I will not post mini-biographies on the aforementioned painters. Who I am certain are wonderful artists in their own right. Since I do not know them well enough, I will not rely on what is posted on the internet to profile them. 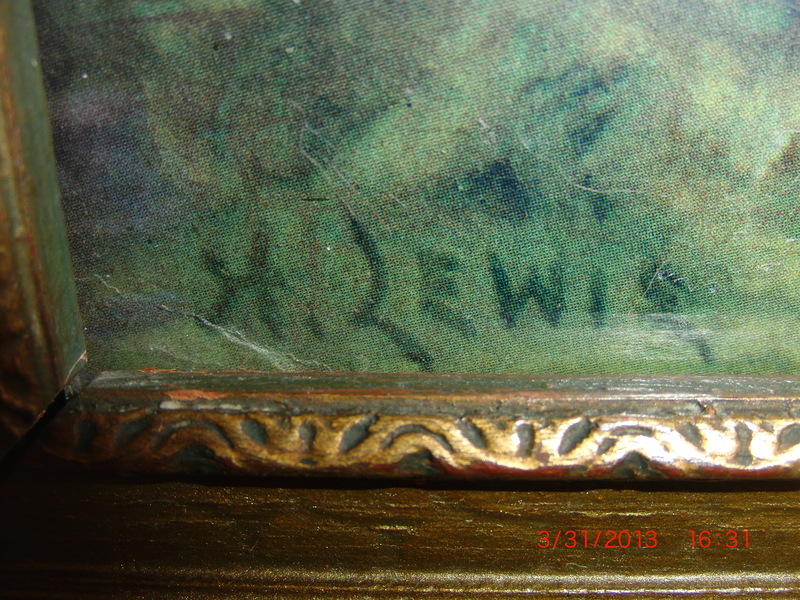 This entry was posted in The Art and tagged 19th century art, 19th century artist, American artists, H Lewis, h. lewis signature, Henry Lewis, Hubert Lewis, Lewis, Lewis Harris, misinformation, New Jersey, Pastel, pastels, Pennsylvania, r. atkinson Fox, signature. Bookmark the permalink. I have a painting signed H. Lewis, I live in Ohio and I was hoping it’s original. Can you please help. Will you please send me a photo of the painting, as well as a photo of the signature to ksnazzy@comcast.net? I’m not an art expert, but I may be able to help you determine if it is an original. We were cleaning out my mothers house a few years back and found this vase and flower painting by H. Lewis and wanted to know if this picture is worth anything. Will you please send me a photo of the painting, as well as a photo of the signature to ksnazzy@comcast.net? I’m not an art expert, so I can’t tell you it’s worth, but I may be able to give you some information that may help. I have 2 pictures that have the signature H. Lewis. Can I get some information on them? Yes, please send photos, with separate photos of signatures, to Ksnazzy@Comcast.Net. I’d love to see them. Hi I have what I think to be an painting by H R Lewis. Is there any info you could give me on this artis? I could send you a pic of the one I have. Thanks so much. I’d love to see a photo of your piece, also, if you can send a separate one of the signature, I can verify if it is Hubert Lewis art. If you give me permission, I’ll post your picture on this website as well. Please send to ksnazzy@comcast.net. This website has some information about H R Lewis, and I just compiled a book that is now availed as a Kindle book, but will be available in book form in a few weeks through Amazon as well. When it is available I’ll post information on this website.